Many people agree it’s very challenging to live on $1,200 per month, but this is the amount that 9 million people in the United States are receiving as Social Security disability beneficiaries. The amount may be fine as additional pay for a person with other means of obtaining money, but often these benefits are the only source of income of a disabled person. Some disabled people decide to augment their spending money with financing they get from using credit cards. While this idea can have positive outcomes, over time it is problematic because people often do not even have enough to pay for basic necessities. If you suddenly become disabled and find yourself incapable of holding down a job to earn money for your living expenses, applying for Social Security disability benefits may help you support your family’s finances. 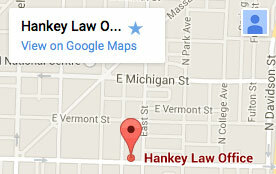 Get in touch with our attorneys at the Hankey Law Office by calling our Indianapolis offices at (317) 634-8565 or (800) 520-3633 so our legal representatives can help you. Big reforms need to be implemented in order for the Social Security Disability Insurance program to avoid becoming insolvent by 2016, Cornell professor Richard Burkhauser told the U.S. Senate Committee on Finance at a hearing, the Cornell Chronicle reported on July 25. According to Burkhauser, the beneficiaries of the program have risen by nearly sixfold to 8.8 million in 2012 from 1.5 million in the 1970s, while inflation-adjusted SSDI expenditures have reached $137 billion in 2012 from $20 billion. After the Americans with Disabilities Act of 1990 was passed, disabled people became more dependent on SSDI payments to compensate for actual wages, although these payments were originally intended as a necessary supplement to earned wages. The attorneys at the Hankey Law Firm in Indianapolis have decades of experience handling Social Security disability benefits cases. We know how important it is to submit a complete, correctly filled out application to gain SSDI benefits and may be able to help you get the funds you need. Call our offices today at (317) 634-8565 to learn more about our services. According to data recently released by the Social Security Administration, the number of Americans receiving disability benefits has increased to 10,996,447 in April of this year from 10,981,423 in March, CNSNews.com reported on May 20. The current number is still higher than the entire populations of Greece, Tunisia, and Portugal. The next population overtaken will be Cuba at 11,047,251, data from the CIA World Factbook showed. The people who benefited was comprised of 8,942,232 disabled workers; 153,475 spouses of disabled workers insured in the program; and 1,900,740 children of disabled workers. Among those individual categories, none broke records for the month. However, their combined number is the highest ever amount of recipients in the disability program since its inception. Our attorneys at the Hankey Law Office in Indianapolis provide legal service to residents who have concerns regarding Social Security disability procedures. We are committed to solving our clients’ legal problems. Call us today to discuss your situation at (800) 520-3633.